Every four years on Election Day, German citizens make their way to the ballot boxes to vote for the political party and candidate they would favour entering the government. What these voters are not aware of, is that whether their choice has resulted from political conviction or not, the set of political attitudes that found their favour is the result of a complex communication strategy the individual party’s carried out long beforehand. Simply put: through political language, parties exercise power. This study looks at the mechanisms behind the communication strategy the Greens (BÜNDNIS90/DIE GRÜNEN) carried out. It focusses hereby on the language shown in their election manifesto of 2009, specifically analysing the many Anglicisms used. 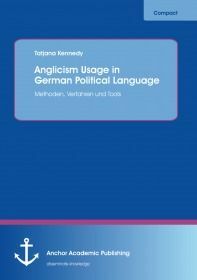 With this, the study gives a theoretical and empirical approach to the question what role the English Language plays in the political Language of German politics, particularly German Green politics.